I was re-introduced to shooting just over 5 years ago. I shoot prone target rifle competitively for Worcestershire County at Dudley Rifle Club along side shooting individually and for the club. I have shot at County level for the past 12 months. It’s a good feeling to work your way up from starting out shooting groups off a wooden block and moving into a jacket and sling, of course, there are many obstacles along the way when starting out, and it appears that they do not stop as you progress. From using club rifles which are used by many different people and having to re-set up the rifle each time you shoot whilst not actually having a solid reference point of what works – which can be overcome with getting your own rifle, to having to learn each intricacy of how to get in the perfect position for each shot, which comes with practice. I started shooting at Dudley Rifle Club just over 5 years ago. Regardless, one of the biggest set backs when you start getting confident in your abilities is the nagging feeling that perhaps that shot that should have been a 10, is actually a 9 and you can’t explain why. And it very well could be the ammunition that’s being used in the rifle. What I’m going to talk about now is my experience of batch testing ammunition to my rifle at the Lord Roberts Centre on the NRA camp of Bisley. Basically, ammunition that comes out of factories is made in batches, they could be different based on a number of factors, particular numbers made through specific dies, and batched due to the amount of wear on the machinery as they make hundreds of thousands of rounds. Different seating depths and lengths of bullets, to variations in primer and powder configurations and constituents. 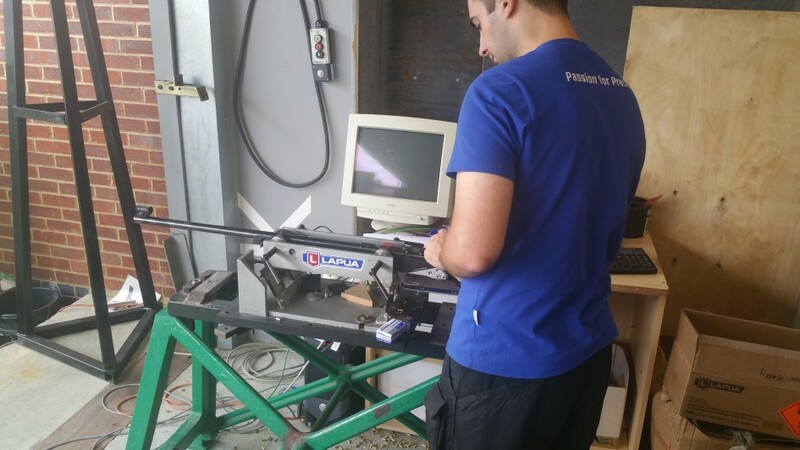 Batch testing means that you fire different batches of ammunition (which are identified by imprinted batch numbers on the boxes of ammunition) and shooting groups at a target until you find one that shows the best potential for your rifle. The endeavour is slightly different for full-bore rifles, although the techniques here would work when only batching against factory ammunition if handloading rounds for your rifle is not your cup of tea. How Is The Rifle Batch Tested? Both myself and my father were having our individual rifles batch tested, and whilst I’m sure the process is almost exactly the same for the rifles that get taken to Lord Roberts, the way in which they batched our two rifles was similar but not the same, down to the stocks that we both have. My father has an 1813 Anschutz Single Shot bolt action rifle in a System Gemini Precision rifle stock. I have an 1913 Anchutz in an Anschutz 2213 stock. Note: the 1813 and 1913 designations are the model of the rifle, and not the year, however I'd love to think that my rifle stock is from the future...! Because the Anschutz stock that mine fits in has flat edges, whereas the System Gemini has rounded edges, which means that in order to clamp the rifle into the vice for shooting my dad needed to remove the side rounded skins to give a flat surface to avoid movement, a procedure which was not necessary for the Anschutz. 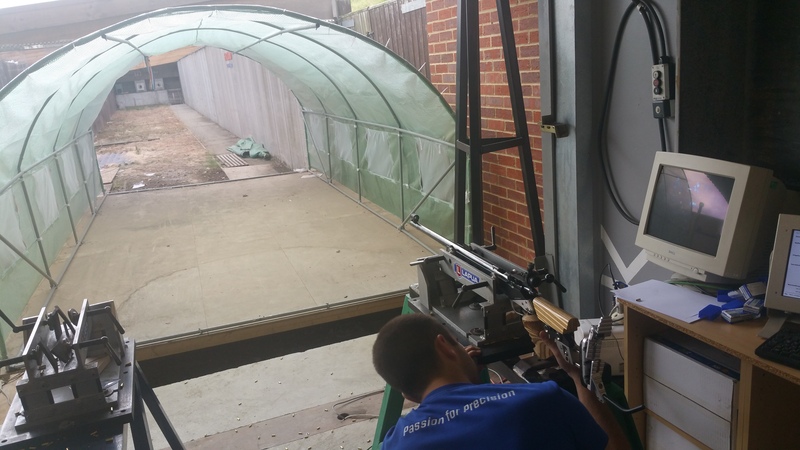 Note: Eley Test Centre completely remove the actioned barrel from the stock to test their ammunition. This was, in reality the only difference between setting up from my rifle to my dads. The vice used was heavy wrought iron and bolted to the floor. It would not be moving at all. There was a custom made attachment on the top of the vice which had 2 screws on the underside in line with the accessory rail on the underside of the stock. There were also 2 clamps on each side to hold the rifle tight in line with the target. 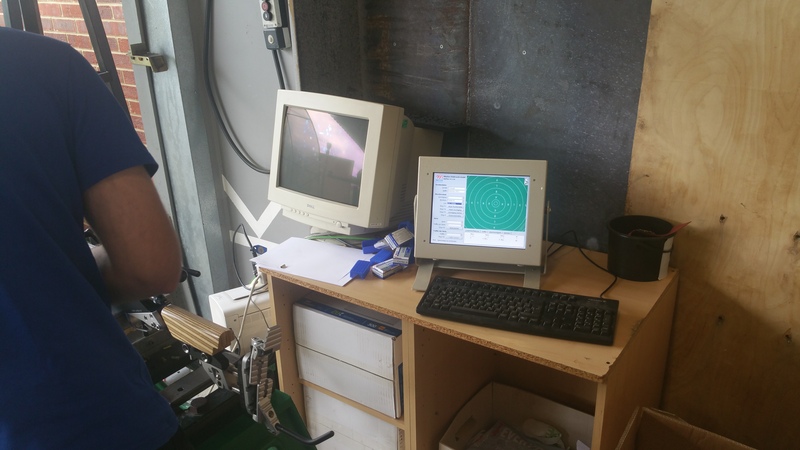 The range is at the far end of the Lord Roberts Centre, which is 50m long and uses electronic scoring targets with each firing point having it’s own monitor. 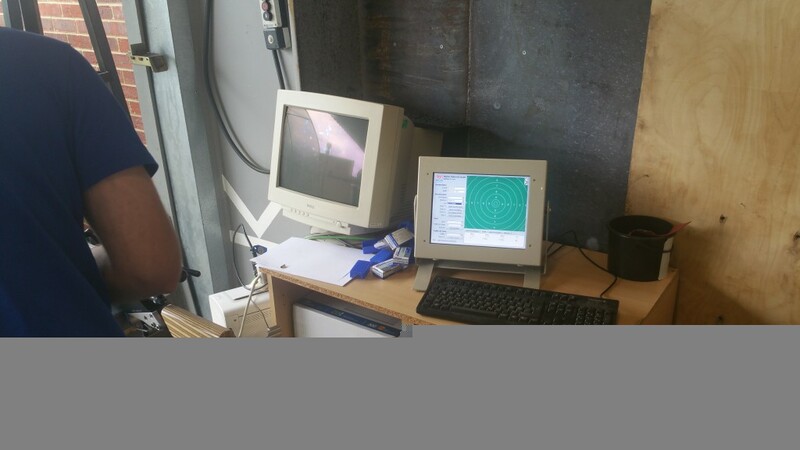 The Batch test set-up is noexception, however it uses a different system for scoring shots. The 2 targets set up on this end of the range are completely enclosed from the elements with corrugated plastic all the way down the sides and on the roof, and as you can see in the above picture, a “tunnel” bridging the gap between the indoor section and outside. From what I could tell the system used on these 2 machines was a modified version specifically for testing ammunition. It plots the shots for each batch and centres the group over a 50m diagram so you can plot the expected scores you would be likely to receive from each batch and it’s corresponding spread. it also gives the testers the ability to replay in order the shots to see what the rifle was doing shot by shot, great when a second opinion is needed from more experienced testers on the range. Target rifle barrels tend to work a little better once they’re warm, and this can take anything from 1 to 5 shots to tighten the group and stop the “cold bore shot” flyers. With my dad’s rifle, the first shot went out to the 8 ring and high and right, the rest then stabilized. Mine however threw 3 out into the 8 ring in a similar place before settling down. 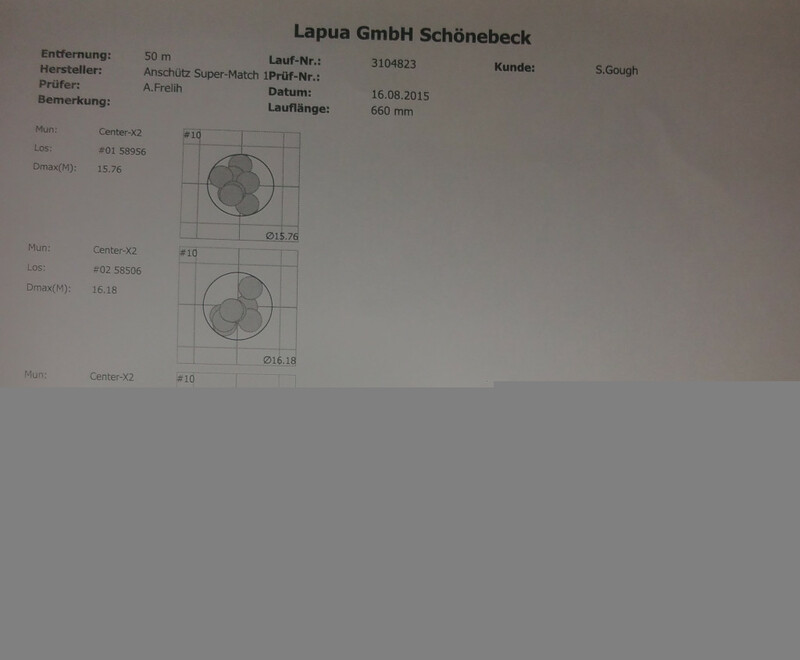 Lapua tested 14 batches of Centre-x that the NSRA had available and also a further 5 batches of Midas+ in each rifle. 10 shots were fired from a pre-warmed barrel in controlled fire. From what I could tell the tester was using a consistent method of pushing the round into the chamber, then closing the bolt in the same manner each shot. Some batches were well over 20mm within the first 5 shots, the tests on these batches were aborted, however some of the group sizes appeared to be within 10mm for the first 4-5 hits and opened up towards the end of testing, much to our dismay! My father who had gone through this process last year was hoping for the same or better than his rifle did with a previous batch of centre-x; roughly 15.5mm spread over 10 shots. I was hoping for better… we’d bet on it, there was a pound at stake! Since my dad was on first he put up a best group size of 14.90mm at 50m. He was chuffed that it beat last years. The midas+ did not group well at all with most batches well over 17mm in both our rifles. 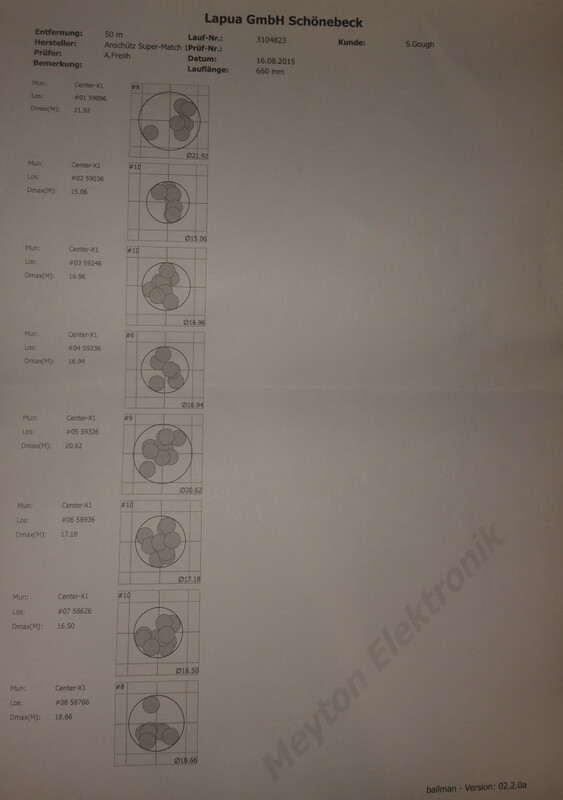 My group was slightly worse at 15.06mm at 50m. I’d lost, but not by a massive amount. 0.16mm (0.0063 inches). The batches that matched each rifle were not the same, further indicating that although the same make and presumably chambering, each individual rifle likes different ammunition. Well, It’s not bad. Relatively speaking. My rifle barrel is an unknown quantity. It’s second hand and had an unknown quantity of ammunition shot through it over the past however many years it’s been around. I bought it second hand, and who knows how many shots the previous owner put through it. 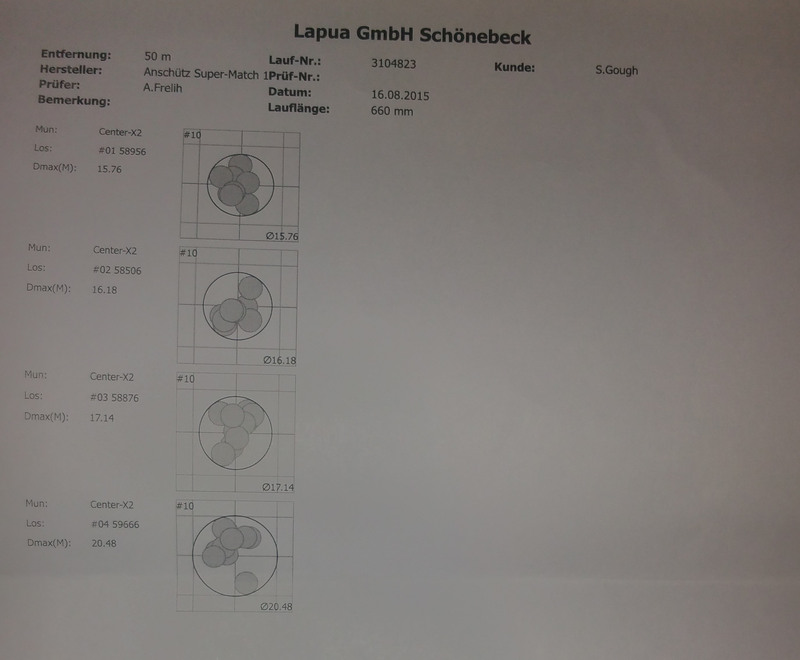 For context, the world record for a 40 shot group @ 50m at ELEY test centres is 12.4mm – but the 10 shot groups that rifle was shooting were averaging 11.5mm with the smallest at 11.0mm. The guys testing at Lapua said that they had a 12.XXmm group earlier that day. 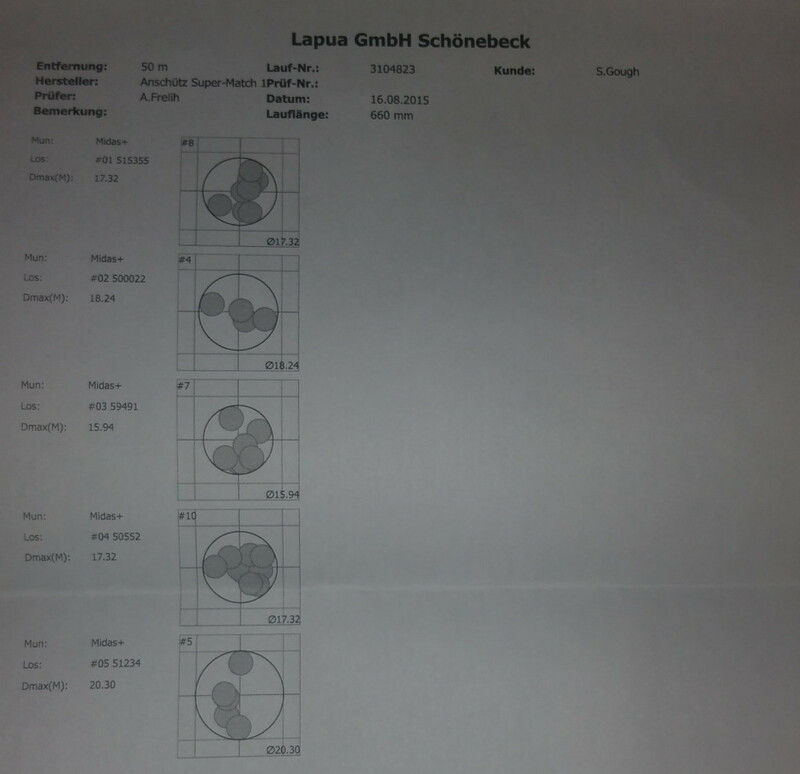 Lapua generally suggest that anything below 16mm is a good grouping, so I’d say it’ll do for the time being. To put it another way, the rifle is definitely shooting better than me with this combination, of that I am sure, which hopefully gives me that little edge to improve without being able to blame my equipment! Well, I’m curious to see how Eley fairs in my rifle, but something tells me it’s going to be a while until I find out just how well… Eley’s test centre is 15 miles or so from where I live, so I intend to pop-by sometime and have a look and see if they’ll test my rifle. This may have to wait until I chew through some of the rounds I picked up from this batch though. Whilst we were at the Lord Roberts Centre (Home of the NSRA) I had a mooch around the store for other things that might take my fancy. Since I’ve been piling on the pounds the last 12 months, my jacket barely fits me, I decided to upgrade from the one that was thrown in and barely-ever-fitted-me-right-in-the-first-place and splash out on a Kurt Thune shooting jacket. I managed to shoot this Wednesday with both new jacket and batch tested ammunition and put up a 97 and a 96 on NSRA 2510 B.M 10 shot 25 yard targets. Above my average but room for improvement. For the first time in a long time I felt solid as a rock on the firing point, and could see where my shots were going wrong. I was however struggling from the heat, one of the perils of learning to shoot in a jumper, when it’s summer and warm for consistency you have to sweat buckets on the firing point! Add in the steam on my glasses and I can see where I can improve to find those last 3/4 points for my first POSSIBLE (100/100). Hi Do you or will you be batch testing Eley .22 rounds as my gun is set up for Eley rounds only. I have not yet batch tested Eley .22 rounds, although Eley are based in Birmingham, which is only 15 miles away from me, I should look into this at some point. My only bug-bear is that it’s either Tenex or Edge that you can batch test with Eley, and although I’m sure their Tenex is the most consistent ammunition, I’d much rather find Eley match ammunition that suits my rifle down to Price. Why do you say your rifle is only set up for Eley rounds? Each batch within each manufacturer will be slightly different to the next so you may find a batch of Manufacturer A has the exact same properties of a batch from Manufacturer B. Without testing, you’d never know. I’ll keep you posted if I head to Eley though, this first batch of Lapua Centre-x is nearly all gone and I need to be on the lookout for the next batch.